Anytime I drive around with my friend Steven, I can be sure to leave the car with some new favorite, previously unheard lost soul classic that he just happened upon. 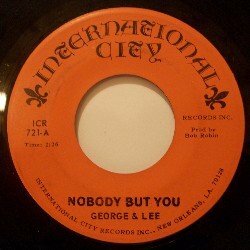 Last week, it was George & Lee's "Nobody But You," a New Orleans deep soul treasure, that we listened to 3 times in a row, dissecting every charming note. I'd like to thank Ana-B over at the indispensible "The Singing Bones," for getting the following information to me. It was long assumed that George & Lee were George Davis [not Russell] and Lee Diamond [who co-wrote "Tell It Like It Is"].....but the man in charge of this session, Tommy Guarino, has said the duo was actually George Perkins ["Cryin' In The Streets"] and Lee Tillman ["All These Things"]. My original post cited George as session guitarist George Russell and Lee Diamond. This tune is actually an early 70s cover of an older Lil Bob & The Lollipops tune. Lil' Bob and The Lollipops were a band out of Lafayette, whose "I Got Loaded" was a dance hall staple of the 60s, even though it was the b-side of "Nobody But You." You might know the Los Lobos version. Here is the original. But back to George & Lee. Steven and I laughed over some key moments, like the harmony that gets away from one of them at about 44 seconds. That harmony gets better at 1:30, and then, taking a different approach by going for the low harmony, it gets nailed at 2:04. There's also a great moment at 1:47 where the band all seem to be accidentally in sync. The riffing on the guitar at 2:16, also brought out some smiles. We pictured a scenario where, some guy paid for studio time, and just corralled whoever was in sight. "Hey you! You play the drums? No? Well, you do now. You! Put down that broom and stand behind that mic. We have 3 minutes to lay down this two and a half minute tune." Through all the flubs and tentativeness, George & Lee's "Nobody But You" has a groove, and improves over Lil' Bob's laid-back, "Teasin' You" groove. Below, is Lil' Bob's take, which is fine, but it's no wonder the b-side got more play. Your info is not entirely correct. Funny 'cause I was just about to post the record myself, along with the updated info. Thanks Ana-B. That's fantastic. I appreciate the update. Very interesting tunes. They sound professional enough for me. Nice and rare findings. I guess that's why we listen to music in the first place, and are still at it. I particularly like Nobody But You by George & Lee. Fun! I like the idea of liking music and learning about music one shiny 45 at a time. That's where the true love happens. Loving an album is such a grown-up thing; but loving a 45 single is eternal youth.